It’s no ordinary robot, it’s an UBR-1. 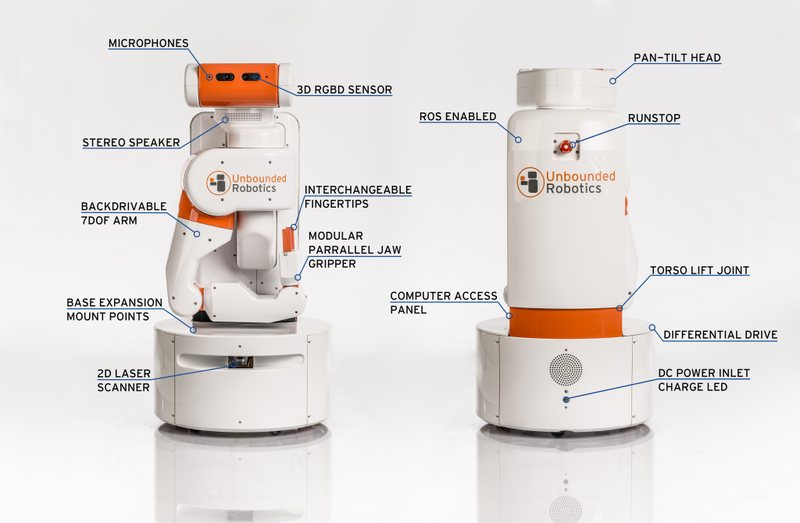 From Unbounded Robotics, the UBR-1 is one of the most sophisticated yet affordable robots available in the world. From today, you can preorder the pro model of the UBR-1 for $50k and expect to take delivery in August 2014, if you are in the US, Canada or Mexico. Anywhere else, you may be waiting a bit longer. What can you do with your new UBR? According to Unbounded, UBR can set the table, do the dishwashing and naturally, fetch beer. But domestic or research tasks aside, UBRs have applications in small business and industry, particularly in areas not previously automated. Some possibilities include supermarket end cap or shelf stocking, or logistics tasks that require autonomous mobility as well as manipulation. The pro model features the newest Hokuyo UST-20LX scanning laser, and the UBR-1 now has higher maximum speed, more RAM and a larger hard drive capacity. Complete technical specifications are available here. The last year or so has been quite a roller coaster ride for the team at Unbounded Robotics. After bringing UBR-1 into being in an incredibly short time for a new robot (although about the same length of gestation as a human baby), UBR-1 launched in late October 2013 to great interest. Since then, researchers have been kept on hold as the company has been ‘in talks’. For a while there it looked as though one of the tech giants was going to scoop up another great robotics company, leaving the rest of us gazing wistfully over the walls of the secret gardens. I, for one, am excited to see UBR taking its first steps in public.